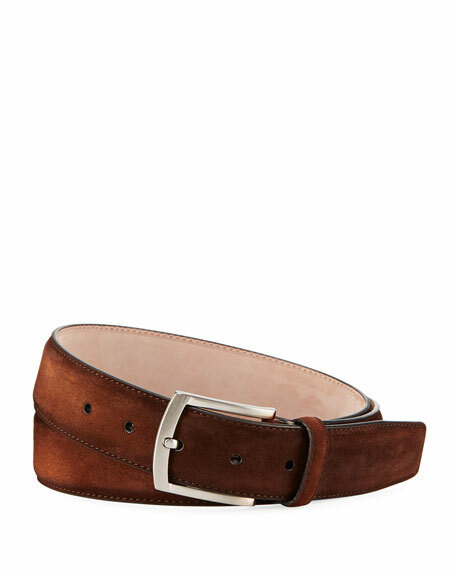 Magnanni for Neiman Marcus belt in calf suede. Shinola "Essex" leather belt with double stitch detailing. Stainless steel buckle. Approx. 1.5"W. Made in USA of Italian material. Shinola "Navigator" belt with double stitch detailing. Nickel-plated brass hardware. Approx. 1.5"W. Bovine leather. Made in USA. Shinola "Rambler" belt in bovine leather. Aged brass square buckle. Signature bovine leather. Approx. 1.5"W. Made in USA of domestic and imported materials.